Is there any specific protocol or traditions that need to be observed? Traditionally, the bride's parents host an engagement party as a chance for both sides of the family and for future wedding guests to get to know each other before the big day. While the bride's family may still host the event in some cases, it's very common for today's couples to host the engagement party themselves. While some couples choose to skip the engagement party altogether, this event offers several unique opportunities for everyone. 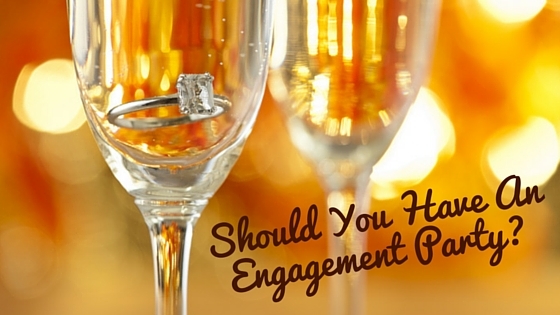 Here are a few reasons why you might want to include an engagement party in your wedding plans. 1. It's A Chance For Both Sides Of The Family To Get To Know Each Other. You and your fiancé obviously know each other well, but your families may not have had the chance to spend much time together. The engagement party offers a perfect opportunity to let your friends and extended family members break the ice with one another. 2. You Can Tell Your Engagement Story Over And Over. Let's be honest - one of the best parts about getting engaged is getting to tell your friends and family your engagement story over and over again. All of your guests at the engagement party is there to celebrate your big event, and they'll be begging you to tell them how he asked you all night long. 3. You Can Cut Down On Your Wedding Guest List. Are your parents begging you to let them invite all one hundred of their closest friends to the wedding? Having an engagement party can be a great compromise. After inviting everyone to the engagement party so that they all feel included, you can keep the guest list for your actual wedding smaller. 4. You Get To Celebrate Your Wedding - THREE TIMES! Your wedding is an incredibly exciting event - why limit yourself to only celebrating on your actual wedding day and at the rehearsal dinner the night before? By having an engagement party, you and your groom (along with all your friends and family) will get to celebrate a third time. How awesome is that? 5. You Can Kick Off The Celebrations NOW - No Need To Wait! This benefit is especially appealing to couples planning longer engagements. If your wedding is over a year away, having an engagement party is a great way to kick off the celebrations without having to wait all the way until the wedding day finally arrives. 6. You Will Actually Get To Spend Time With Your Guests. Between last-minute preparations, hair and makeup, getting dressed, taking pictures, the ceremony itself, and all the traditions at the reception (the first dance, cutting the cake, the garter/bouquet toss, etc), you will scarcely have any time leftover to visit with your guests. At the engagement party, however, you will have plenty of time to visit with the people who came to celebrate with you. It's easy to get caught up in the stress of planning your wedding that you forget to step back and enjoy the process. You're preparing to marry the man of your dreams - it's important to let yourself enjoy the journey! Having an engagement party can be a great way to get a break from the craziness of wedding planning and enjoy celebrating with your fiancé, your friends, and your families. Need Engagement Party Supplies? Check Out WhereBridesGo.com! When you're planning your engagement party, don't forget to visit WhereBridesGo.com for all of your party supplies. We offer a great selection of toasting flutes, decorations, party favors, and everything else you need to plan an engagement party that everyone will love. Happy shopping!